The hard chrome plating plant’s Energy Team has been working with engineers at KPPC since 2010. Since then, the company has reduced its overall electricity costs, upgraded the plant’s lighting, and made improvements in its compressed air usage to reduce emissions. Hausner Hard Chrome expanded into Owensboro in the late 1970s. The company’s Elk Grove Village, Ill., operations began in the late 1960s. The company offers a full spectrum of plating services for remanufacturing customer equipment and machine parts for all industries. These services include in-house hard chrome, machining, and fabrication. KPPC provides free, customized, techinical services to help businesses and industries with pollution prevention and energy efficiency. Cam Metcalf, executive director of the KPPC, presented the award to Hausner’s employees and management Thursday. KPPC sent engineers to Hausner in 2010 to conduct an assessment, and the engineers followed up with recommendations for improvements. Employees worked with Owensboro Municipal Utilities to install new capacitors, and lighting at the plant was upgradded — based on the KPPC recommendations. “The lighting is so much better technically and resulted in cost savings, but at the same time, the brightness allows employees to do their work better and provides a more pleasant atmosphere,” Davis said. KPPC’s recommendations relative to compressed air usage were also implemented, he said. Winners of the Environmental Sustainability Award must be committed to three principles, Metcalf said. They have to be taking responsibility for: the essential well-being of their employees and the the community, achieving economic benefits, and practicing environmental stewardship. “Hausner Hard Chrome certainly met all the criteria,” Metcalf said. Another key factor in this recognition is the company’s involvement with the Kentucky Energy Alliance, which provides networking opportunities for businesses and industries working on energy efficiency and waste reduction. Alliance members pledge to reduce energy use by 2.5 percent per year for 10 years. Hausner — one of 29 industries in the alliance — has nearly reached the 10-year goal in two years with a 23 percent reduction, Metcalf said. And the local company also is one of six members serving as mentors with company leaders presenting at meetings and agreeing to be a resource when other members have questions. Davis commended the state’s collaboration with U of L to establish the KPPC. United States Playing Card Co. of Erlanger was the other recipient of the award. 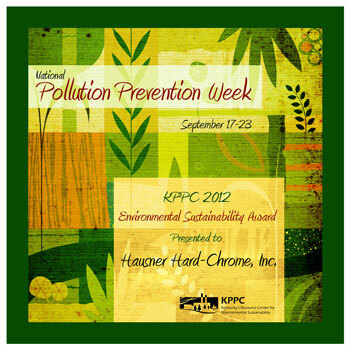 This is the fourth year for the honors that generally are given during National Pollution Control Week.